Imagine what you could do if you had access to a freemason's forbidden collection of rare journals and texts. What you're about to discover is the REAL secrets behind "The Lost Symbol", Dan Brown's latest masterpiece. Simply interested in Masonic philisophies and theories. In his book 'Morals and Dogma' (accepted universally as 'the bible' of Freemasonry) Pike admits: "Masonry like all religions, conceals its secrets from all except the Adepts and Sages, or the Elect and uses false explanations and misinterpretations of its symbols to mislead; to conceal the Truth which it calls Light, from them, and to draw them away from it. Listen carefully: If you're looking for rare & lost freemasonry & masonic texts and journals, look no further. SecretsofMasons Ultimate Compendium provides you with over 120 extremely rare documents, journals & books covering freemasonry and the masonic knights templar. Quite frankly, these documents aren't available anywhere else in the world and are extremely hard to find. These information are previously only available to Masons of the highest order. It gets even better because these books feature esoteric works, handbooks, masonic regalia rituals, constitutions, historical works, centenials & celebrations, rare periodicals, lectures, masonic lodges documents & plenty more. Most of the materials offered here are complete documents, journals and books. Here's the scenario: Most books and resources that deal with Freemasonry information are complete garbage. They skip over many important parts, or simply contain general re-hashed information. SecretsofMasons explores the darker side of Masonic conspiracies, murder, and world manipulation. Find out if this secret "brotherhood" is really a religion or a cult? How was the Ark of the Covenant uncovered? What are the items found inside of it? Who is buried facing the Ark underneath Solomon's Temple? What was found inside the secret vault underneath the Sanctum Sanctorum in Solomon's Temple? The mystery behind the cross of Jesus Christ. - Where was it discovered and was it proven to be authentic? Did the Garden of Eden existed? Where is it in the modern world? Warning: One thing I want you to be clear - Some of these materials are highly controversial and downright shocking. You should only use this information for personal education and with extreme caution. Go behind closed doors with unprecedented access to the secrets of the Masonic Order. You should know that the Freemasons has been suspected for centuries of plotting to overtake the world, accused of fomenting revolution, and reviled as devil worshippers that stole King Solomon's treasure. The Freemasons claim they're merely a civic-minded fraternity, bound together by harmless rituals. Which is closer to the truth? 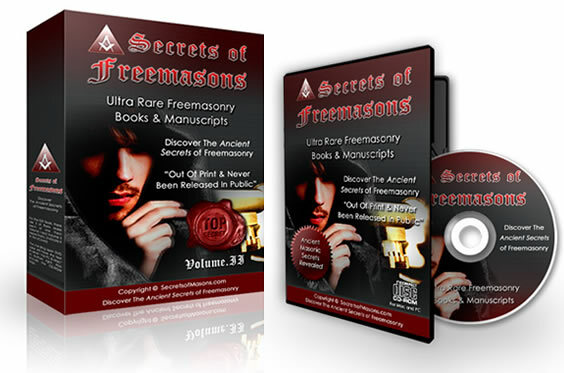 "...I Highly Recommend This For Researchers or Freemasons "
there is a gargantuan amount of insider's information here with over 130 out of print books and journals. I especially loved the in-depth coverage on masonic rings. I've been a freemason for many years yet I'm still blown away by many of the information revealed here. I highly recommend that you purchase this if you're a researcher or a freemason. - 2 Who Will Follow In Our Train? - & Much More Not Listed!  But Don't Just Take Our Word For It. the best I've ever seen... "
Simon, your materials is some of the bet I've ever seen as a life-long historian on freemasonry. If you are a Freemason, this offer a unique insight into many aspects of the Craft. If you are not a Freemason, but have an interest in what goes on in the Lodge you will certainly gain some insight from this collection. SecretsofMasons is a solid addition to your Masonic library. This is, by far, the largest and most comprehensive freemasonary collection I've ever seen. "I couldn't sleep the entire night after reading the first 3 chapters." the local Masonic Temple to find out more. Since then, I have met tons of Freemasons locally, from around the United States and the world. ...For the serious Freemason or historian, seeking accurate information , this title is the best one to have. If you can only have one item to buy, buy this one. "...the breadth of its content is amazing. Absolutely outstanding! " includes great pictures and illustrations. For any Master Mason this is an essential addition to his personal library and to that of the Lodge. You see, Ive helped over 200 educators, researchers and freemasons, discover and unravel facts and myths about freemasonry that they never knew. Why do I say this? Because once you read everything in this compendium, you'll instantly know more than 99% of the so-called "experts" on freemasons and all the false information and conspiracies that is out there. 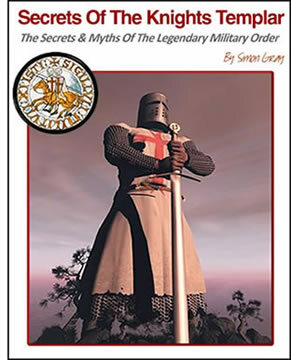 You'll also receive the "Secrets of The Knight Templar" which will reveal the myths and secrets of this legendary military order that time has forgotten. Why were the knights templar forcibly disbanded? 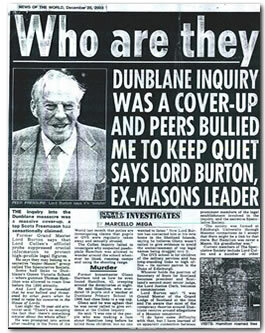 One of the most mysterious and tenacious conspiracy questions of history exposed. Where the templars wiped out or did they survive by starting new orders to preserve their secrets? This is a time-sensitive bonus that is only available to the next 230 21 members ( or before before in 2 days) so order it now before it's gone. A Risk-Free Test-Drive For A Full 60 Days! Buy this today. Try it out for a full 60 days. Pull it, twist it, take notes and discover all the secrets. If you feel it really wasn't worth the investment, just return the product, and I will deposit your payment right back into your account. It's my 60-day  risk-free, love-it-or-leave-it, full money-back personal promise. But Simon, How Much Will This Cost Me? Do the math: It would cost over $1150 for just these 6 books! And the total value of the entire collection of the SecretsofMasons Ultimate Compendium would literally run you into the TENS of THOUSANDS of dollars! Is Only $497 $297 $197 $97 $37! For obvious reasons, I'm only offering this for a limited number of people. I've decided to only release SecretsofMasons Ultimate compendium and the Knights of Templar bonus to the first 230 people only. Like I said before, this is a *time-limited* offer and as soon as the first 230 orders are sold, this offer will be removed. I've got my eye on it like a hawk, and when we reach that point, I'll withdraw this offer FOREVER and not apologize for it. Sure, I could continue to sell the this after 230 people. But I want to make it prohibitive and available only to serious customers. In fact, after 230 copies I'll likely raise the price to $697 or even higher! make you an offer you simply can't refuse! I will receive it in via airmail, for a tiny one-time price of $37...before this offer is gone forever. I also understand that a package that contains such massive information at this price is not available anywhere else in the market. Plus there's absolutely zero-risk to me because this is backed by a full 60 days 100% money-back guarantee. PPS: I am taking all the risk so you have got nothing to lose. I am 110% sure you will be happier than a 5 year old on Christmas morning with your package. But if for any reason you are not, no worries. 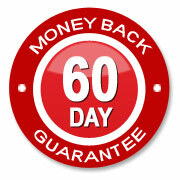 Your investment is guaranteed for a full 60 days. Don't Walk. Run To Pick This Up! " "...There are a lot of good reasons to buy Simon's product. But the thing that really jumped out at me is the section on symbolism. That is what completely sold me. I am recommending it to all who come into my study circles. If you're a Freemason... get this product. Don't walk...run and pick this up. You will not be disappointed. No ifs, no ands, no buts. Just get it!